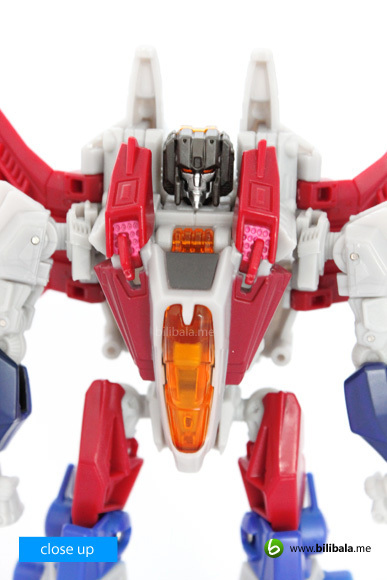 Starscream is part of the third wave of the 2012 released Transformers Generations. 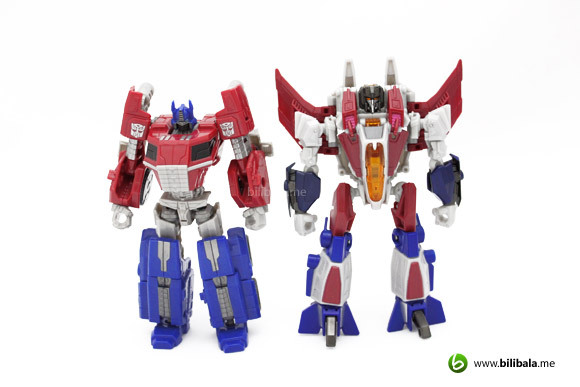 Heavily based on the design for the Fall of Cybertron console games, you wont be expecting to see him in a skinny and tall appearance as compared to more recent reincarnation in the Transformers Prime series. Read on to find out more what he has to offer! 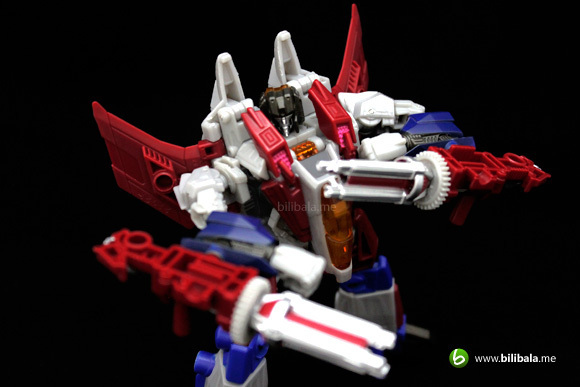 Starscream is always related to a jet/aircraft alt mode. 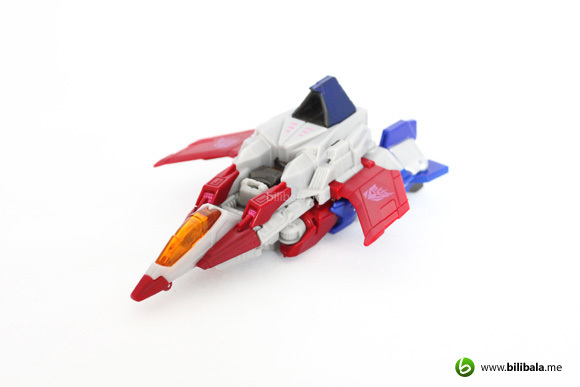 It isn’t hard to expect him so being a cybertronian jet fighter. 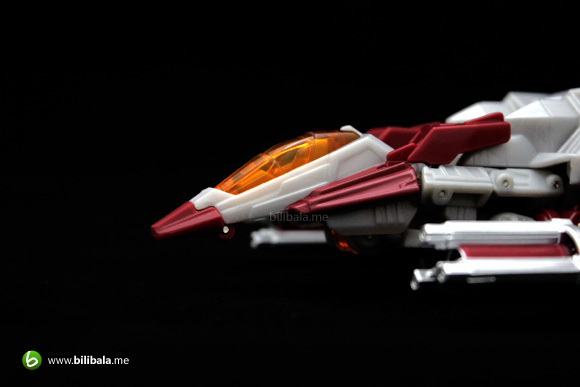 Being as true as the form in the game, you will be seeing the same triangular design for the alt mode. 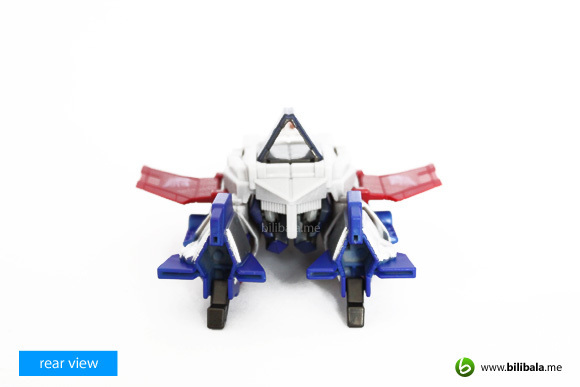 At first glance, the design has a certain reminiscence of the older Transformer Cybertron version. 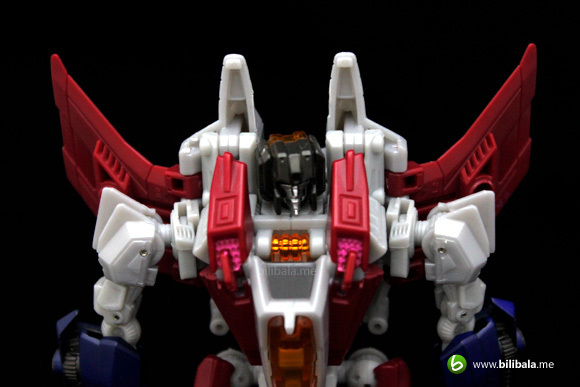 You get to see the same bulkier structure around the mid section of the plane while having a slimmer wing. Clumsy as it looks, it is not as sleek and lengthy look as compared to the design in the game. Close enough, but yet, not that close. 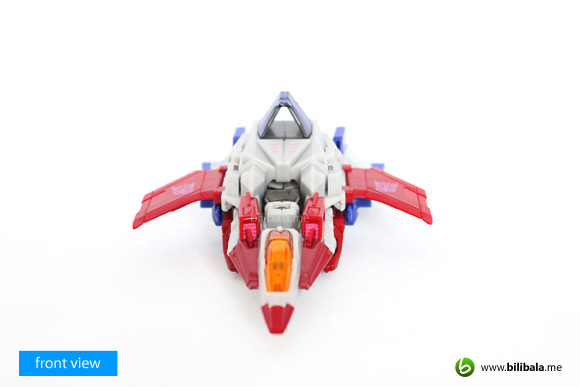 The alt mode is being pampered with G1 colors: Red, light grey, blue and with an exclusive transparent orange colored plastic being used in the cockpit. Much of the colors are from the plastic itself and paints application are very minimal. 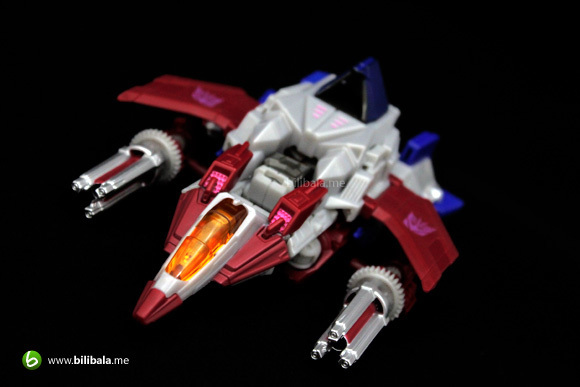 Most paint applications are only noticeable on highlighting certain details such as front/roof air intake vent (painted in pinkish red) and silver paint located at the rear of the craft. Side profiling shows how bulky the mid section is being constructed. 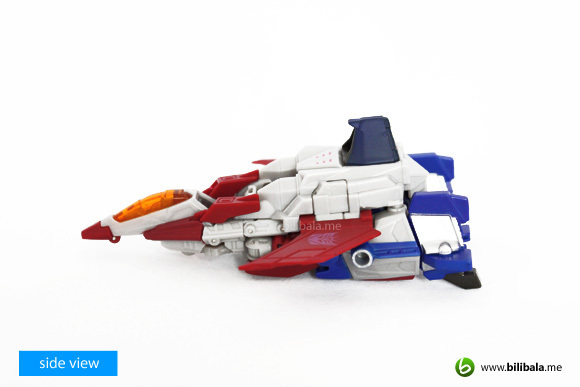 Well, you can always leave the leg flipped into the compartment. I left it opened instead to show a more symmetrical view of the rear. 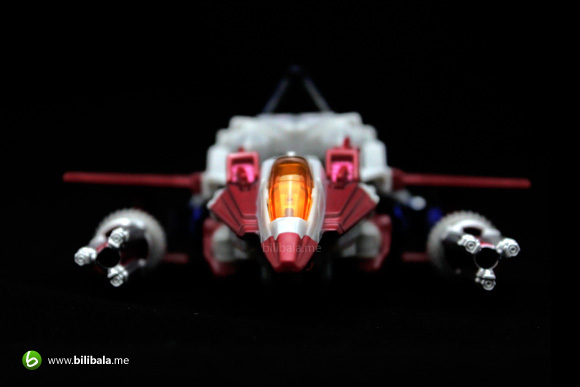 It looks more like a jet afterburner after all. The new design exhibits polygonal approach. A lot of angular edges and finishes which constituted the overall look and feel of the craft. In actual fact, there are not a single curve edge noticeable. You can notice some details inside the orange cockpit as well such as the pilot seat and the very raw control panel of the craft. 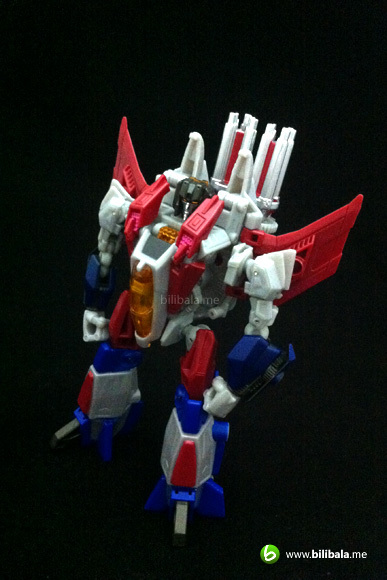 The robot mode looks much more better and game accurate. 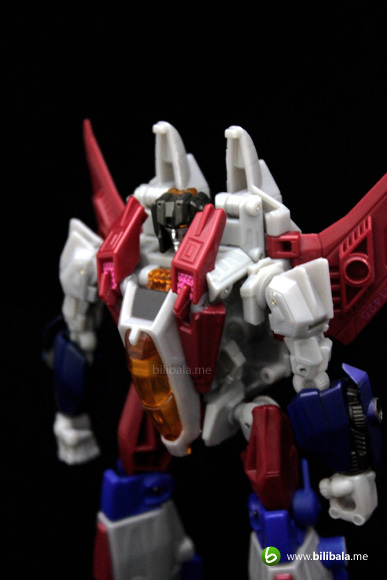 Again, the new robot mode does have the shadow of the G1 design which noticeably the same inverted wings, head sculpt, the 2 pointy shoulder and torso section as well. 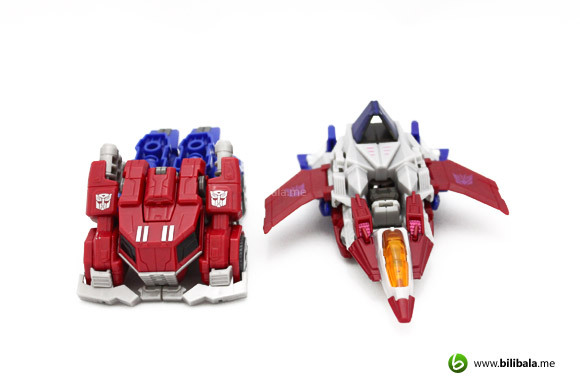 At first glance, I somehow felt that the robot mode is bulky and quite short in size. Though being bulky, there are actually less back kibble and overall weight to body proportion is nicely done. 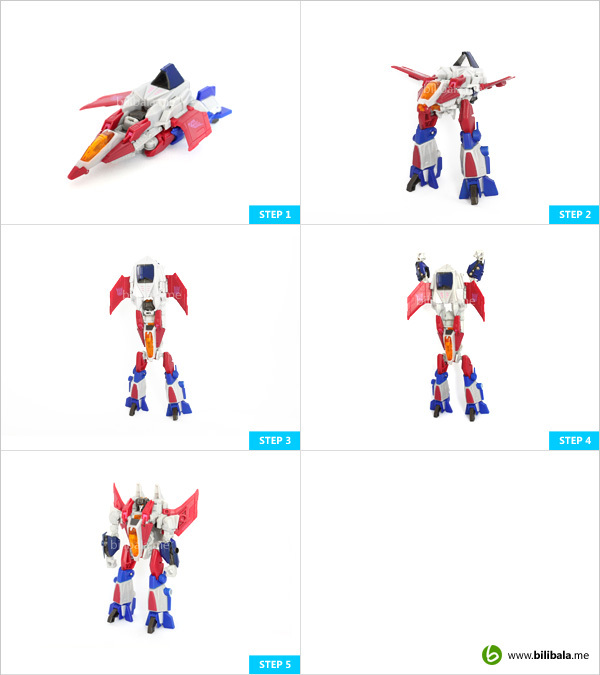 The only complaint I have is the angular (or crossed shaped) legs which make him difficult to stand at certain pose. 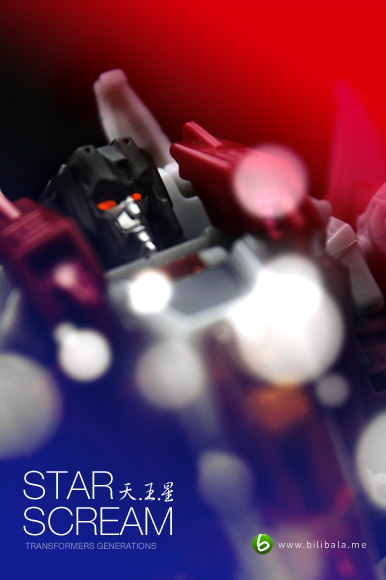 In all, he pretty much pose well with multiple articulations. While being a detailed front, the back doesn’t look as promising. 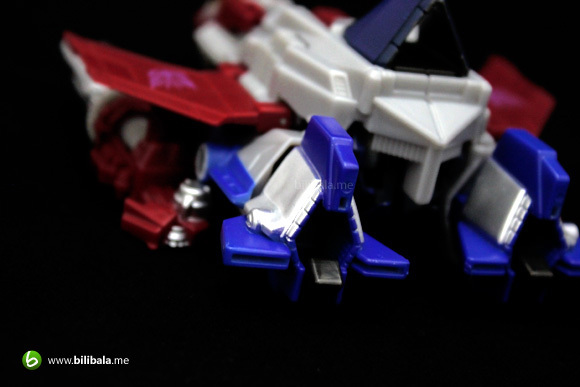 In fact, he does look like to have a turtle back that gives the overall clumsiness of the robot mode. Oh well, better than some robots with hollow back I guess. 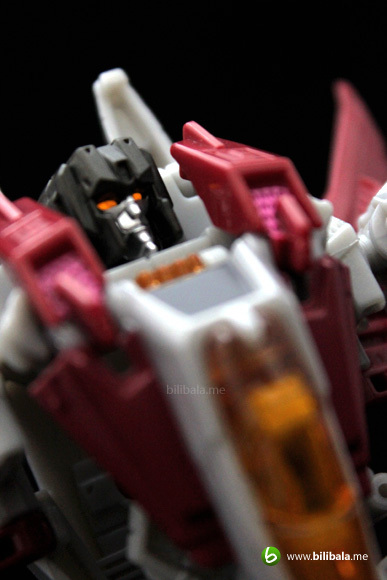 One thing that impressed me deeply is the very prefectly done head sculpt of him. Overall G1 inspired and designed sculpture which is being dressed with silver paints on his face and orange light-piped eyes. I personally like how the orange cockpit being blended in with the overall look and feel. It somehow makes the figure stand out. 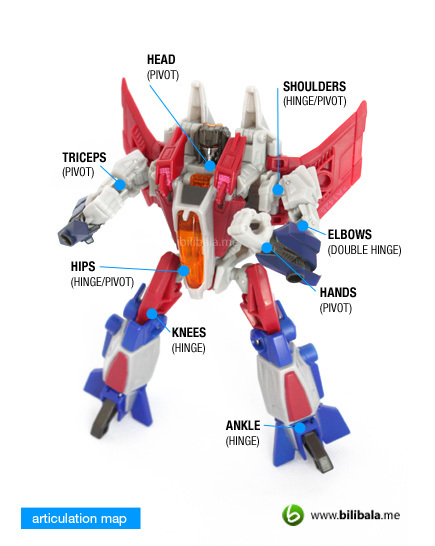 He has quite standard articulation with the exceptional of double hinge joints being used in the elbows. These double hinges are crucial in the transformation process. However, they have used a pivot joint for the head and a missing waist joint does reduce a bit of the figure pose-ability. Transformation isn’t that difficult and resolves heavily on the upper body. 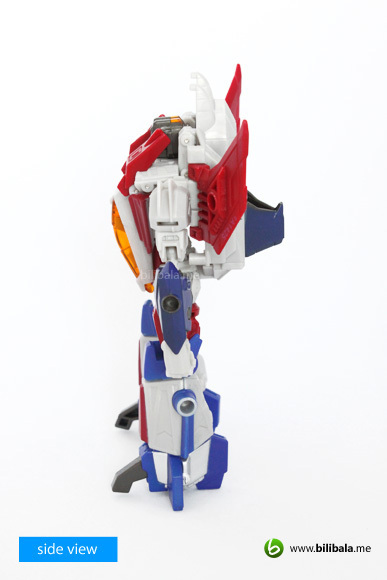 The leg portion exhibits no transformation at all in fact. 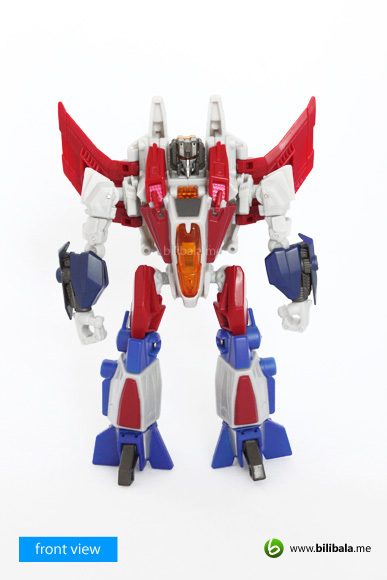 Pretty much like a Macross kind of transformation where legs are being flipped to the back and both of the arms are resided in the same manner as what a Macross robot did. 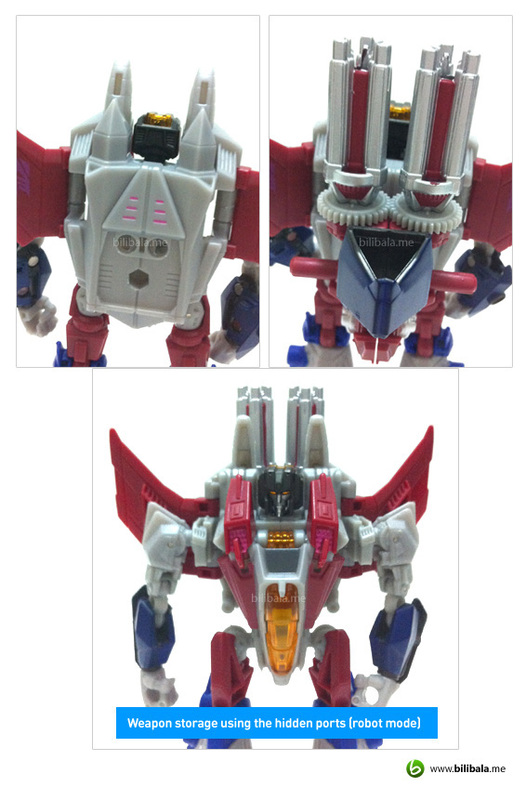 In certain sense, you can actually have a gerwalk version of him as well. No surprises. A very brief comparison of size of the same class with the same line. 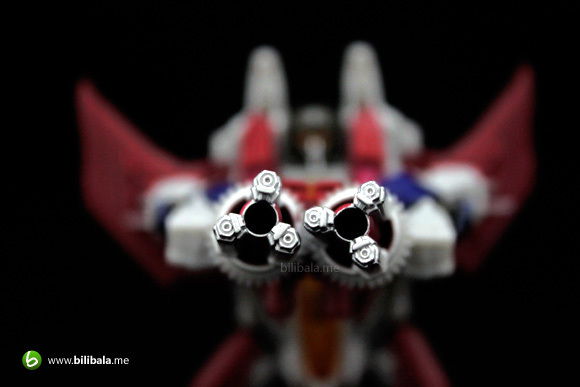 Surprisingly, Starscream is taller and bigger compared to Optimus Prime in robot mode. 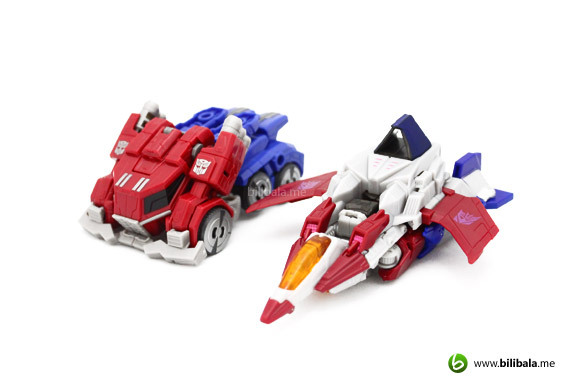 Overall, it is a nice figure which somehow “close” to the game but the design of the alt mode does seem bulkier and clumsier. 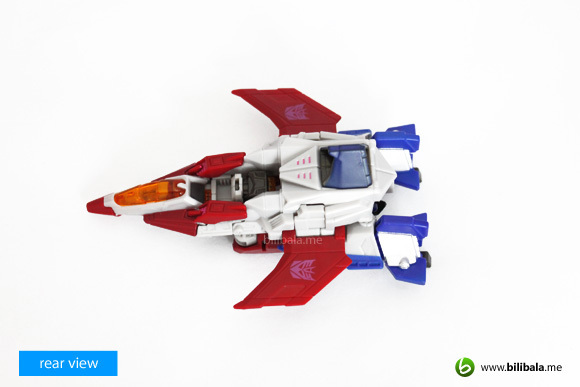 The robot mode exhibits a much more better and accurate design. I like the colors being used and the gimmicks he has to offer. Not to mention, the easter egg feature which not most of the collector knows. If you have one, try it out! 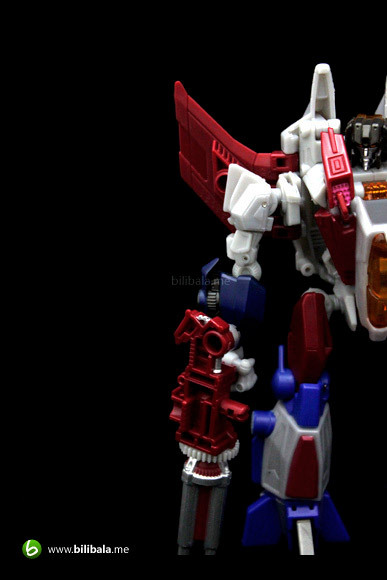 What I like – Overall color distribution and composition; prefect head sculpt; gun gimmicks. 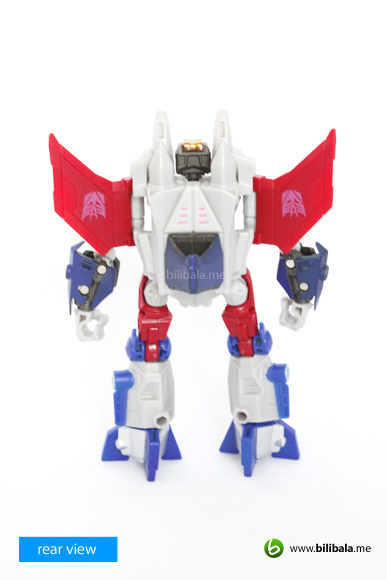 What I dislike?– Bulky/clumsy modes; crossed shape legs. Don’t forget to subscribe to our newsfeed to get the latest scoop of Bilibala here: Subscribe now! 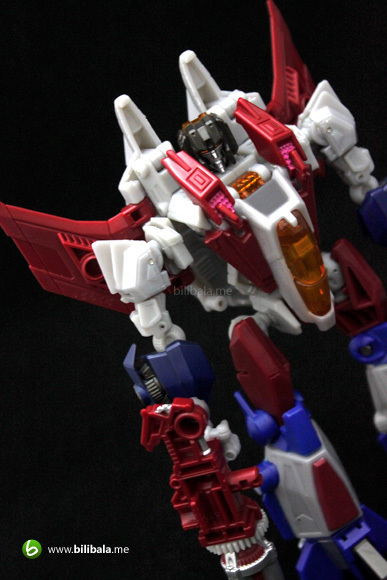 Wow, Starscream looks wicked cool in this form! Good review as always!